Short Synopsis: After being framed for murder, Huntress must prove her innocence. After meeting The Question, we learn her story as the only surviving family member of a mafia hit. The Bottom Line: A character-driven drama with noirish elements and a well-plotted story line, written on one of Rucka's good days and with great art, to boot. Read it! Why It's Good: The comics medium, by its very nature, doesn't lend itself well to stories about moral choices and character change. After all, if a character keeps changing over his or her decades-long history, are we going to recognize them anymore? This works, though, for certain characters, and for flashback stories for popular, well-established characters. The Huntress herself is a character in constant internal conflict, always straddling the line between Justice and Vengeance. When it comes to her family history, that line, in her mind, gets a little blurred. Fortunately, Huntress never lets this conflict devolve into an angsty angry-at-her-life attitude. Instead, she's out for blood. Our story starts with the murder of two mafiosos who have each been killed with an arrow from Huntress's crossbow. The media, the police, and even Batman and Family suspect she's guilty. Just when it seems like she's got no one to turn to, she nearly runs over The Question one night, and after some sparring, he absconds with her to his Super Secret Zen Hideout, where he and Richard Dragon give her a new outlook on life. The story's a weighty one, heavy on backstory, and with clear-cut stakes for both Huntress and The Question. For Helena, she must not only clear her name, but choose who she ultimately is: an agent of revenge struggling away from a broken past, or someone "better" than that who upholds the law. The Question hopes Helena will put his wisdom into action after investing his time in taking her under his wing, plus there's the possiblity of a romantic relationship. I'm not going to give away the ending, but it's a good one. The Art: I really enjoyed the art. It's quite different from today's comic art: very "2D" with little shading, and the characters' expressions are very slightly caricatures while at the same time preserving realism. His figures are realistic: no over-roided guys or DDD-busted girls here. There's a great efficiency of line and cleanliness to the style and inking that you don't see today unless you crack open a Johnny DC title. It's a nice, refreshing break from the complicated, fantasized, hyper-reality of comics art today. Not only that, but Burchett draws Vic Sage really well. Vic is a real character, and that should show on his face, and Burchett thankfully doesn't hold back on the smug little expressions that only Vic Sage is capable of. Compare and Contrast time! Vic channeling the Great James Cagney? Not to mention, there's all sorts of great little visual details, like Vic punching a soda machine. If anyone gets to punch a vending machine in the DC Universe, it's Vic Sage. 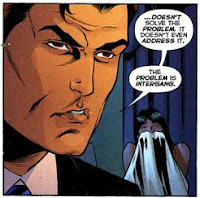 Oh, yeah, and Batman shows up. And Vic gives him some lip. That's always amusing. The only downside to the story is that it's rather complicated to keep all the mafiosos and who-did-what and who's-related-to-whom straight. But I wouldn't let that detract from a very enjoyable story. It's a shame it's not in print anymore--hopefully it'll be reprinted soon. But I urge you to look for it and read it, if you haven't already. The only downside to the story is that it's rather complicated to keep all the mafiosos and who-did-what and who's-related-to-whom straight. > A friend of mine says the same thing about Law & Order (a show I love just for the cop interviews / legwork)..."We were investigating the murder of Mike Appleby, so we questioned his business partner Joe Wheeler, and he said to talk to Sarah Herring, who turned out to be an arsonist under investigation by Detective Mario Maples, who we found out was on the take from Big Don Mavosa who actually hired Sarah Herring and her brother Pete. Pete was a drug addict who messed up the job, according to our CI Corey Mosely who moonlights as an artist - he's really good, btw...and then...oh, what was the original crime we were investigating again? Who got murdered again? Is that the new Batman book? 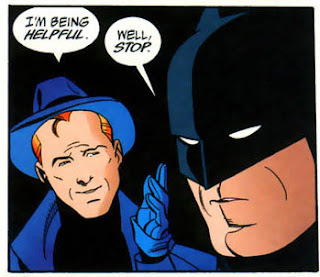 They should really have team of heroes who constantly (and sarcastically) call Bats on his BS. It could have Vic Sage and Metamorpho and a few others. It could be called "Batman and the Snarksiders"
Bwaha! I saw that Metamorpho post that Comics Make No Sense put up a few days ago and that was pure gold. Oh, yes, and I am very much anticipating The Return of Mr. Grumpy Gills book. I always did like the idea of the Huntress and the original Question as a couple. 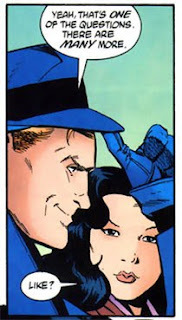 I was really sad when he was replaced by Renee Montoya, though I really do like her, too. I know! They were like oil and water but I think they would've been a great couple/working partnership. I wasn't happy with Renee as Question II. I like her--but as a detective working the streets of Gotham. Though I am enjoying the recent Renee/Huntress team-ups in Streets of Gotham. I guess Huntress pair well with any form of The Question. 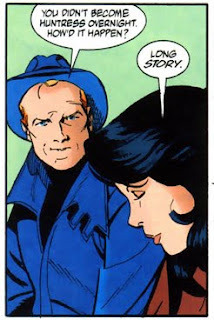 I do love Huntress and Question as a couple, at least as portrayed in Justice League Unlimited. Gail Simone's take on Helena really works for me, though if someone could work in a little more of the pre-Crisis Huntress' accomplishments (lawyer, consumer advocate, fought major villains, JSA member,) I'd really appreciate it. Well, it's Rucka before he revised The Question yet again in 52, so Cry for Blood was a present surprise for me. I honestly can't figure out whether I like Rucka or not...it depends on the day. I think the portrayal of the Question in the JLU animated show was the best of all his incarnations. Then I'd rank Ditko second, then O'Neill, then Rucka. I'm ashamed to say I haven't read Simone's Birds of Prey. I'm not the biggest Gail Simone fan so, meh, not high on my list of things to read. As long as whoever's writing her portrays her as an an Italian-American Roman Catholic who's also a badass, I'm happy.